Ice Skates, Figure Skate Boots, Skating Blades, Cheer Apparel - Kinzie's Closet. NOW through 04/30/2019, Take 10% off your order of $100 or more! Not valid on MAP products, skate packages or clearance items. Kinzie's Closet will be closed 04/7 - 04/15 due to the Master's Golf Tournament. All skate, boot and blade orders will continue to process and ship as normal. Accessories & clothing orders will not be processed or shipped until 04/16/2019. **FREE SHIPPING on all orders over $49! Figure skating sale. Clearance skates. Great sale on figure skates, ice skates, figure skating clothing and figure skating accessories. Clearance Dancewear. Figure Skating Accessories & Ice Skating Accessories. 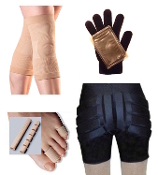 Buy figure skate guards, padded short, skate soakers, gloves, ice skate laces, fuzzy soakers & skate tape. Figure skates, Figure Skating Boots, Figure Skating Blades. Buy Jackson figure Skates, Riedell figure Skates, Risport, Wilson figure skating Blades, MK figure skating Blades, Eclipse skating Blades & Paramount skating blades. Buy cheerleading apparel from Kinzie's Closet. We have everything you need for cheer, cheer shoes, cheer bras, cheer shorts, cheer packpacks. We carry Nfinity backpacks, Nfinity Shoes, laces and socks. Buy gymnastics leotards and gymnastics apparel at Kinzie's Closet. 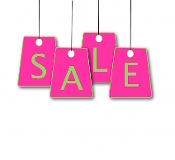 Great sales on gymnastics leotards. Figure Skating padding and protection. We carry bung pads, Silver Lining padded shorts & Capri's, knee pads, ankle pads and more. Figure Skating Dresses and Ice Skating Dresses. We carry brands like Jerry's, Mondor, Elite Xpressions and ChloeNoel. Ice Skating Tights, Figure Skating Tights. Choose from a selection of Mondor figure skating tights, ChloeNoel figure skating tights, over the boot skating tights, footed figure skating tights and footless figure skating tights. Buy Dance Apparel, Dance Tights, Tutu's and dance shoes. We carry girls dance leotards, character shoes, and dance costumes. 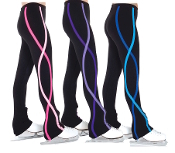 Buy Figure Skating Pants from brand names like Jerry's, Chloe Noel, ES Performance Sportswear and bZipt. Buy figure skating jackets and ice skating tops from famous brands like IceFire, ChloeNoel, Jerry's, ES Performance Sportswear and more. Figure Skating Skirts, ice skating skirts. Kinzie's Closet has cheer bags, dance bags and skating bags. Buy Figure Skating bags like Zuca and Kiss n' Cry. Buy cheer bags and backpacks like Nfinity backpacks. Buy ice skating bags and dance bags from Kinzie's Closet. Buy mens figure skating apparel at Kinzie's Closet. 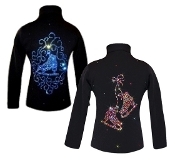 We have mens figure skating jackets, figure skating pants, figure skating tops and figure skating apparel for boys. Buy figure skating jewelry, American Girls ice skating outfits, hair accessories like bunheads, tiaras, costume accessories and more. Buy Holiday Dance Dresses, Holiday figure skating costumes, and Christmas costumes at Kinzie's Closet. **Free shipping applies to the lower 48 states ONLY(Excludes Hawaii, Alaska, Military and US protectorates and international destinations). All orders outside of the 48 states will receive a PAYPAL REQUEST for extra shipping charges. Free shipping does not apply to bulk skate orders (more than 4 pair of skates) as freight shipping will then apply. We have everything you need to help you excel in figure skating, dance & gymnastics. Need dance apparel? Shop Kinzie's Closet. Need Cheer apparel? Shop Kinzie's Closet. New to figure skating? Kinzie's Closet will help you find the right skate and the right size. Kinzie's Closet is a great place to shop for figure skating apparel, figure skates, figure skating boots, gymnastics apparel and dance apparel. Figure skating, gymnastics, cheer and dance are demanding sports. Figure skaters need equipment that will support them and help them achieve their dreams. So Kinzie's Closet provides the best selection of Riedell skates, Jackson Skates, Risport skates, and GAM skates for our customers. Jackson figure skates have been the top pick of coaches world wide for skates. The Jackson artiste, elle and classique figure skates are top quality beginner ice skates. The Jackson Freestyle, Debut and Premier figure skating boots are great for intermediate skaters. 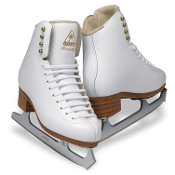 The Jackson Elite and Elite Supreme figure skating boots are for advanced figure skaters. If you want Riedell ice skates, We have a great selection of Riedell skates as well. The Riedell 119 Emerald, Riedell 133 Diamond and Riedell 223 Stride are great for beginner skaters. The Riedell 229 Edge, Riedell 255 Motion and Riedell 435 Bronze Star are for intermediate skaters. The Riedell 875 Silver Star, the Riedell 1375 Gold Star and the Riedell 3030 Aria are for advanced skaters doing double and triple jumps. If you want Risport, we carry the best selection and prices of Risport skates on the market. From the Risport scott hamilton figure skates for beginners to the Risport RF3, Risport RF3 Pro, Risport Royal Pro figure skating boots to intermediate skaters, we have you covered. More advanced skaters will prefer the Risport Royal, Risport Royal Elite, Risport RF1 Elite and Risport RF1 Exclusive. GAM Skates are also great skates made by Jackson. The GAM Pirouette, the GAM select and the GAM Concept are great for beginner skaters. The GAM Bronze Label, GAM Silver Label and GAM Gold Label figure skating boots are for advanced skaters. We also provide the most fashionable apparel on the market like ChloeNoel, Jerry's and Icefire Skatewear to help them look their best during figure skating practice and figure skating competitions. If you are looking for figure skating pants, figure skating tops, figure skating tights or figure skating jackets, we have you covered. The ChloeNoel P06 and ChloeNoel P22 are the most popular figure skating pants. If you are looking for figure skating dresses, we have those in abundance. From practice figure skating dresses to competition skating dresses, we have the best selection. We also have a great selection of figure skating accessories like figure skate blade guards, skate soakers, skate blade covers from brands you know like Guardog and Rockerz. Need protection from falls? Get the Silver Lining padded capri's or shorts, or the Skating Safe padding so that when figure skating jumps don't go the way they planned, skaters can have a soft landing. Dancers and Cheerleaders also want to look fashionable. So Kinzie's Closet has lots of dancewear, dance leotards and cheer apparel that will help them look their best from gymnastics leotards, dance leotards, cheer shorts and more. The Nfinity cheer shoes and Nfinity backpacks are the most popular cheer shoes and cheer backpacks on the market. We have the latest cheer shoes like the Nfinity Flyte, the Nfinity Evolution, Nfinity Titan and the Nfinity Rival cheer shoes. We also carry dance bags, cheer bags and other dance accessories. Shop Kinzie's Closet for all your ice skating, dance, and cheer needs.